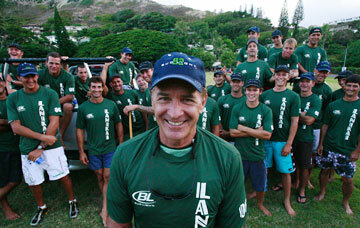 Lanikai Canoe Club coach Tommy Connor and his crew are trying to win their third straight Molokai Hoe canoe race. In building and maintaining a winning tradition, there are periods of transition. Successfully blending these changes into remaining elements of the old mix can lead to more winning and even stronger traditions. What: 41-mile race from Molokai to Oahu considered the world championship of men's long-distance outrigger canoe paddling. When: Tomorrow, 7:30 a.m. start, with first finishers expected around 12:30 p.m.
Where: Starts at Hale O Lono Harbor, Molokai, with finish at Duke Kahanamoku Beach, Waikiki. Who: An international field of about 100 crews is expected, with countries like the U.S., Australia, Tahiti, Japan, Canada and Italy to be represented. With two new paddlers in its top crew, Lanikai Canoe Club hopes its current transition translates into a third straight win in the Molokai Hoe tomorrow. The Molokai Hoe is a 41-mile race from Molokai to Oahu across the Kaiwi Channel that is celebrating its 55th year and considered the world championship of men's long-distance outrigger canoe paddling. About 100 international crews are expected to compete. "I've been working toward this for the past couple years. It's been a struggle at times, kind of having to pay my dues," said Aaron Creps -- who, along with Patrick Dolan, is a newcomer among the nine in Lanikai's top Molokai Hoe team. "Those (veteran) guys have been trying to groom some of us younger guys and make sure that Lanikai's tradition continues -- (the one) that they started. "Having been in the program for a while helps with the transition, and I think helped me and Pat be able to contribute this year. We did have a good racing season up until this point, and hopefully it will continue." The Windward Oahu club did win two of the three long-distance races leading up to the Molokai Hoe this year. The seven others in the first crew -- brothers John and Jim Foti, brothers Kaai and Kekoa Bruhn, Mike Judd, Dave Daniels and Mike Pedersen -- were on the winning Molokai Hoe teams the past two years. And the majority of them have paddled together for much longer. The Foti brothers and Pedersen, in particular, have been on five Molokai Hoe-winning teams since 1995 and were part of the crew that established the race record (4 hours, 50 minutes, 31 seconds) in 2000. Yet, while the veteran stars have always taken pride in their own success, they've also always made the continued success of the club a top priority. "We've worked really hard at keeping the door open for new talent and developing our new talent, nurturing that," John Foti said. "It would have been more surprising if we didn't have that (continued success), because of how much energy we've put into it -- coaching, mentoring and all that stuff." Added Tommy Conner, veteran paddler and the first-time coach of all three of Lanikai's Molokai Hoe crews: "One of the reasons I consented to coach them this year was because they have a club-first attitude. ... I'm confident with these guys. I've coached them for enough weeks now that there's nothing unexpected I could foresee, other than some kind of equipment failure, that would doom us. But as far as the physical attributes of all the paddlers, these guys are at the top of their game. At this point -- at least with the first crew -- I'm not a teacher, I'm a manager." Longtime Lanikai paddlers Kai Bartlett and Peter Binney are not with the club this year. Bartlett moved to Maui and now paddles with top contender Hawaiian -- which won the one race earlier this year that Lanikai didn't -- while Binney is on paternity leave. The current Lanikai paddlers are uncomfortable with the role of the favorite and quick to point out others like Hawaiian, last year's runner-up Tui Tonga of the Big Island and top-ranked Tahitian entry Shell Vaa are among the few crews who could win the race. Conditions are expected to be relatively calm in the channel, not exactly helping Lanikai, which is known for its ability in the rough stuff. There remains the fact, however, that despite the top crew's transition, Lanikai is still the two-time defending champ going for a three-peat. A win would also represent the club's seventh title overall (also won in 1974). Since the race began covering its current course from Hale O Lono Harbor, Molokai, to Duke Kahanamoku Beach in Waikiki almost 30 years ago, only Oahu-based Outrigger Canoe Club has managed to win it three straight times (1986-88). Waikiki Surf Club won six straight from 1958 to 1963 on two different courses of similar distance. "I was kind of aware of" the chance to three-peat, Creps said. "I'm kind of a history buff; I like to know what's happened in the past. It's a difficult thing to do ... just because of guys getting burnt out, crews kind of falling apart, the channel having different conditions, international crews coming in and out of the scene. So, it would definitely be special to win it again this year."